These Betting Rules apply to any bets placed on www.betway.co.zm. If you do not agree with these rules, you are not entitled to place a bet on www.betway.co.zm. A bet can be broken down into two elements, the "Bet Amount" - how much you risk, and the "Potential Return" - your potential winnings including your Bet Amount. “Games” means any and all games / offerings by Us. "We/us/our/the Company" means, SupaCasino Limited, which is the owner and operator of the website. “You/Your” and also referred to as “Customer”, means any person who enters the Website and participates in any “Games” provided by Us. The maximum pay-out limit per customer for each sport will be set by the Company, in our sole discretion. It is the responsibility of the customer to ensure they are aware of each limit before the bet placement. In the event of an accumulator or multiple leg bet, the maximum pay-out will be applied according to the lowest limit. Palpable Error Rule: All odds, lines and handicaps are subject to fluctuation and become fixed only at the time of bet acceptance. Where a palpable error or system failure results in an incorrect price, line or handicap taken in a bet – the bet, or part of the bet if it is a multiple /parlay will be void. If the error is noticed in time We will make reasonable efforts to contact the customer to allow the choice of placing another bet at the correct odds/line/handicap. Certain circumstances may arise where a bet is confirmed, or a payment is performed, by us in error. The following examples are a non-exhaustive list of such circumstances: a) whenever the prices/spreads/terms offered by the Us are significantly dissimilar from those available in the general market; b) whenever the prices/spreads/terms offered at the time the bet is placed are clearly wrong given the probability of the forecast occurring; c) whenever a bet has been erroneously accepted on a market which should have been suspended or removed; d) where a bet containing incompatible events is accidentally accepted, because of human or technical error; f) whenever a settlement error is made while computing or crediting the amount of winnings; or (g) any other situation that may be referred to as an error. In all these cases the We reserve the right to cancel all the bets accepted containing such an error, or to correct the mistake made re-settling all the bets at the correct prices/spreads/terms that should have been available at the time that the bet was placed in the absence of the error. Neither We (including our employees or agents) nor our partners or suppliers are liable for any loss resulting from any error made. Bets placed in order to cover flawed bets will stand valid if not impaired by errors. In the event that, due to technical problems, the printed version of a document or of a coupon differs from the web version, the latter shall prevail. In the event of any dispute You agree that the records of our server shall act as the final authority in determining the outcome of any claim. If any fixture/event is not played or postponed on its scheduled date for any reason, all events will stand for the following day. If after that time the fixture/event is not played then all events will be made void. The Company reserves the right to cancel any bets from customers who place money on an event where they are in any way involved, as participants, referee, coach etc. If you have played in a professional capacity, or in tandem with other player(s) as part of a club, group, etc., or placed bets or wagers in a coordinated manner with other player(s) involving the same (or materially the same) selections; in this instance we further reserve the right, at our sole discretion, to restrict the total maximum pay out for the combined total of any such bets, to the equivalent of the maximum payout limits permitted for a single customer (as outlined in the Company’s general Terms and Conditions). Betway is for sole use on an individual basis and for personal entertainment only. The Company reserves the right to withhold payment and to declare bets on an event void if we have evidence that the following has occurred: (i) the integrity of the event has been called into question or (ii) match rigging has taken place. Evidence may be based on the size, volumes or pattern of bets placed with Betway across any or all of our betting channels. We reserve the right to update these Terms from time to time in order to address legal and regulatory changes, to incorporate changes in our business or the Services offered, or to improve the clarity and helpfulness of these Terms. When the Terms are updated, we will post them on our site and it is your responsibility to check our site from time to time to review any updated Terms when posted. The updated Terms shall govern and control once they are posted to our site. It is your responsibility to retain copies of transaction records and Service policies and rules. SupaCasino Limited is licenced by the The Betting Control and Licensing Board of Zambia to conduct online sports betting (licence number 0000068) under the terms of section 18 of the Betting Control Act. Our Service is restricted to individuals of legal age (18) who are residents of jurisdictions where the use of our Service is not prohibited by law. All bets are void where prohibited by law. You accept that use of our Service is at your sole option, discretion and risk. Furthermore, you agree that use of our Service is for your own personal entertainment and non-professional use and, in doing so, are acting on your own behalf and acknowledge that any activities in violation of these Terms are strictly prohibited. By accepting these Terms, you are fully aware that there is a risk of losing money when betting and you are fully responsible for any such loss. In relation to your losses you shall have no claims whatsoever against us or any of our partners, or respective directors, officers or employees. By opening an account or using our Services, you represent, warrant and agree that you will comply with all laws, statutes and regulations in relation to your use of our Service. We are not responsible for any illegal or unauthorised use of our Service. By accepting these Terms, you agree to assist us with the compliance with applicable laws and regulations. It is your sole and exclusive responsibility to ensure that you are fully compliant with all laws relating to online activity and/or gambling in your jurisdiction. We shall in no way accept liability in situations where your use of the Service is in breach of any state, national or international laws. We reserve the right to close or suspend any customer account without prior notice. You are expected to abide by these Terms at all times and you accept that any breach could lead to penalties including but not limited to account suspension, cancelled bets and loss of winnings. To use our Services, you must first register an account. During the account creation process, you will be required to enter your personal details during the account registration process, which may include your mobile number, full legal name, etc. In the event your registration information is inaccurate or incomplete, you will be required to update such information upon request. By registering an account, you represent and warrant that you are of legal age, are competent to enter into a binding legal agreement, and that you hereby understand and accept all the Terms. You may only register and operate a single account. If you hold more than one account we reserve the right to suspend duplicate accounts. You may not access the Service by means of another person's account. Should you attempt to open more than one account, under your own name or under any other name, or attempt to access the Service by means of another person's account, we reserve the right to immediately close all your accounts and bar you from future use of any of Service. Your Account will be linked to your mobile GSM number and only you, as the owner of these accounts, may deposit on the Website under your name. The account registration process will use your mobile number as your username. You must keep this information secret. Should any customer give away, share or lose his/her account number and/or password, we will not be held liable for any claims that may result from, or regarding that account. Customers are solely responsible for their account transactions and should keep their account information strictly confidential. Our Services are for personal, non-commercial use only. You agree that we are entitled to monitor your gameplay and use of our Service to detect gameplay patterns indicative of professional, non-recreational play. Any professional use of our Service is prohibited. Employees of the Company, its licensees, distributors, wholesalers, subsidiaries, advertising, promotion or other agencies, media partners, retailers and members of the immediate families of each are not eligible to use the Service, and all accounts in violation of this clause will be immediately terminated. You are required to keep your registration details up to date at all times. If you change your address, e-mail, phone number or any other contact or personal information, please contact us in order to update your account information. Your account will be considered dormant if it has not had any activity for 6 months. Account activity is defined as the following: making of a deposit or withdrawal; placement of a bet. Where your account has become dormant and also has a balance exceeding ZWM50,000 we shall attempt to contact you with a view to return any remaining funds. You may, at any time, request temporary or permanent exclusion from the Service. To view the various self-exclusion options available, please refer to our Responsible Gaming Policy. We may refuse to register you as a customer or elect to de-register, exclude or suspend you as a customer from the Service at any time, for any reason or for no reason whatsoever. You acknowledge that we have no obligation whatsoever to provide you with prior notice of our decision to refuse; de-register; exclude or suspend you as a customer, nor are we required to furnish you with any reasons for such decisions. furnish information about you to law enforcement agencies (if the reason for such termination, de-registration, exclusion or suspension was fraud or some other form of illegal misconduct), collection agencies and/or intra-group sportsbook/casino databases. You hereby irrevocably authorize us to do so in our absolute discretion. You agree to pay us for all bets that are placed through the Service using your account. We reserve the right to refuse or limit any bets at our sole discretion for any reason whatsoever. In circumstances where a bet is deemed to be or is declared void by us solely at our discretion (e.g., not as a result of any breach of these Terms), any sum deducted from your account with respect to that bet shall be credited to your account. Wagers shall only be valid if accepted by our server and subject to these Terms. Until acceptance, no communications from you shall be binding on us and all information displayed on this site constitutes an invitation to play only. Should we determine to waive a rule in the interest of fair play to you, it shall only be for that instant and shall not set a precedent for the future. By placing a bet, you represent and warrant that you are not prohibited from entering into the bet by any contract, regulation, rule, or gaming board, and that you do not know the outcome of the event upon which you are betting. In the event these reputations are false, your bet is automatically void. If you use a credit/debit card and/or a financial/bank account for your transactions, the account holder’s / cardholder’s name must be the same as the name you used when registering your account. Should the name you registered on your account and the name that appears on your credit/debit card and/or financial/bank differ in any way, your account will be immediately suspended. Should your account be suspended, we recommend you contact customer service for details regarding our verification process. All withdrawals, regardless of the payment method, are subject to audit before being processed. As a result, payment of withdrawals could take up to 2 business days to process. Updating your payment details will require you to login to the Betway website. It is your responsibility to make yourself aware of the terms upon which your payments are accepted. You are solely responsible to keep abreast of any changes. If we incur any chargebacks, payment reversals or other charges in connection with your account, we reserve the right to recover such amounts from you. You represent, warrant and undertake that no chargebacks or other payment reversals or cancelations shall be made concerning account without our prior written consent. In the event of any such chargeback, reversal or cancelation, you agree to indemnify and hold us harmless against any amounts, costs, claims, damages and expenses arising in connection with such chargebacks, reversals or cancellations, or in connection with our efforts to recover such sums from you. We reserve the right to run credit checks on all cardholders with third party credit agencies on the basis of the information provided on registration. You are solely responsible for any applicable taxes on any prizes and/or winnings that you collect from your use of the Service over and above taxes collected by us on your behalf. We will deduct applicable taxes from any prizes or winnings prior to payment to you; as a result, you acknowledge and agree that any amounts you receive shall be net of such deductions. Where permitted, withdrawals will be processed back to the same payment method used to make a deposit on the account. If a financial account and/or credit/debit has been used to deposit funds, the name registered on the account must correspond to the name registered on the account/card. In the case of a request to pay funds via Direct Bank Transfer (DBT), the acquiring bank account must be held in the same name used during registration. Withdrawals may require multiple transactions over a number of days, based on payment provider limitations. There may be charges incurred for withdrawals. Customers must provide a copy of their proof of identity, address, copies of credit cards and/or other appropriate documentation when withdrawing credits. Proof of identity must match the registered name and surname. If any customer fails to provide this within 4 weeks of our request, the account may be subject to lock out and winnings and/or withdrawals made, voided. In cases of fraudulent documentation, accounts will be locked and all balances forfeited. no further gambling will be permitted until we have successfully verified your details. When we request additional information from you in order to process a withdrawal request, all withdrawal requests will remain pending until the correspondence has been returned and approved by us. We must successfully receive and verify your identification documents, either via internal means or a third party, before you can withdraw from your account. Customers who withdraw a sum of money that is 5 times or more than their lifetime deposits though the Service will only be able to withdraw their winnings at a sum deemed appropriate by Betway The remaining amount will be placed back in the customer’s account until such time that they are eligible for a further withdrawal. This clause will only be applied at the discretion of management. Before any withdrawals are processed, your play will be reviewed for any Prohibited Activity (defined below). Should we determine that Prohibited Activity has occurred, we reserve the right to withhold any withdrawals and/or confiscate all winnings which we reasonably believe are related to the Prohibited Activity. You agree that, in the event of any payment or credit to your account which is made to your account as a result of our error, such amount(s) paid in error shall be held in trust by you for our benefit and shall not be withdrawn from your account. You shall return all amounts paid in error to us promptly upon our demand. We reserve the right to confiscate and recover all amounts paid to you in error. You acknowledge and agree that all rights, title and interest in the Service, including but not limited to intellectual property rights, is our absolute property or duly licensed to us. The “Betway” brand name and any other Betway-related trademarks, service marks and/or trade names used in connection with the Service (the "Trademarks") are the trademarks, service marks and/or trade names owned by Merrivale Ltd., which reserves all rights to such Trademarks. You hereby acknowledge that by using the Service you obtain no rights in the Trademarks or the Service and you may only use the same in complete accordance with these Terms. Any use of the intellectual property related to the Service without our prior written consent is not permitted. You agree not to (and agree not to assist or facilitate any third party to) copy, reproduce, transmit, publish, display, distribute, commercially exploit, or tamper with the intellectual property related to the Service in any manner whatsoever. You acknowledge and agree that the material and content contained within the Service or within any of our websites, software or other properties is made available for your personal, non-commercial use only. Any other use of such material and content is strictly prohibited. THE SERVICE IS PROVIDED 'AS IS' AND WE MAKE NO WARRANTIES OR REPRESENTATIONS, WHETHER EXPRESS OR IMPLIED (WHETHER BY LAW, STATUTE OR OTHERWISE) INCLUDING BUT NOT LIMITED TO IMPLIED WARRANTIES AND CONDITIONS OF MERCHANTABILITY, NON-INFRINGEMENT, SATISFACTORY QUALITY, FITNESS FOR A PARTICULAR PURPOSE, OR COMPLIANCE WITH APPLICABLE LAWS AND REGULATIONS. The entire risk of as to the use, quality and performance of the Service is yours. We make no warranty that the Service will meet your requirements, be uninterrupted, timely, secure or error-free, that defects will be corrected or that the software or server that makes it available are free from viruses or bugs or represents that the full functionality, accuracy and reliability of the Service as to results or accuracy of any information obtained by you. We reserve the right to suspend, modify or remove or add to our website any games or software at its sole discretion with immediate effect and without notice. We shall not be liable to you for any loss suffered by you resulting from any changes made or for any modification or suspension of or discontinuance of the Service and you shall have no claims against us in such regard. We cannot guarantee that the Service will never be faulty, but we will undertake efforts to correct reported faults as soon as we reasonably can. If a fault occurs, you should report the fault by e-mail or in writing to our customer service centre. Although we shall take all reasonable measures to ensure that the Service is free from computer viruses, we cannot and do not guarantee that the Service is free of such problems. It is your responsibility to protect your systems and have in place the ability to reinstall any data or programs lost due to a virus. We are not liable for any downtime, server disruptions, lagging, or any technical disturbances or disruptions to the game play. We are not liable for any acts or omissions made by your internet service provider or any third party with whom you rely upon to gain access to our Services. In the event of systems or communications errors relating to the generation of random numbers, bet settlement or other element of the Service, we will not be liable to you as a result of any such errors and we reserve the right to void all bets. Refunds may be given solely at the discretion of Management. In the event of a website system malfunction all bets are void. We reserve the right to void any winnings that were obtained as a result of hardware/software error or malfunction. We are not liable to you for any loss that you may incur as a result of such suspension or delay. In the above instances, and all other instances previously mentioned where a bet may be voided, the bet event will be paid at a decimal value of 1. For single bets this means that the customer will be paid back the original bet amount. For multi-bets that the customer will be paid at an adjusted total decimal value where the voided game is adjusted to a decimal value of 1. Customers found abusing such errors/malfunctions are subject to having their account closed and any deposits and/or winnings forfeited. We intend for our Service to be a fun, safe and enjoyable experience for our customers. As a result, we reserve the right to monitor the site for unsuitable language and behavior, which may result in appropriate corrective action including the termination of your account. Any betting activity which we reasonably suspect to be irregular, unfair or in bad faith, including but not limited to equal, zero or low margin bets or hedge betting, or placing single bets equal to or in excess of 30% or more of the value of the bonus credited to their account until such time as the betting requirements for that bonus have been met . We shall take all necessary measures in case of suspected Prohibited Activity, including the blocking of your account, freezing of the funds and reserving the right to legal proceedings. Any criminal or suspicious activities may be reported to the relevant authorities. In the case of suspected or fraudulent payments, including use of stolen credit cards, or any other fraudulent activity or Prohibited Activity (including any chargeback or other reversal of a payment), we reserve the right to block a user's account, reverse any pay-out made and recover any winnings. We shall be entitled to inform any relevant authorities or entities (including credit reference agencies) of any payment fraud or otherwise unlawful activity, and may employ collection services to recover payments. However, under no circumstances shall we liable for any unauthorized use of credit cards, irrespective of whether or not the credit cards were reported stolen. Before any withdrawals are processed, your participation in the Services will be reviewed for any irregular betting patterns. In the interests of fair gaming; equal, zero or low margin bets or hedge betting, shall all be considered irregular gaming for bonus playthrough requirement purposes. Other examples of irregular betting include, but are not limited to, placing single bets equal to or in excess of, 30% or more of the value of the bonus credited to your account before the betting requirements for that bonus have been met. Should We deem that you have indulged in irregular game play, we reserve the right to withhold any withdrawals and/or to confiscate all of your winnings. Our total aggregate liability to you in contract, tort, negligence or otherwise, for any loss or damage howsoever arising from any cause, whether direct or indirect, or for any amounts (even where we have been notified by you of the possibility of such loss or damage) shall not exceed the value of the bets and/or bets you placed via your account in respect of the relevant bet/bet or product that gave rise to the relevant liability. We shall not be liable to you or any third party in contract, tort, negligence, or otherwise, for any indirect losses or damages, including, without limitation, damage for loss of business, loss of profits (including loss of or failure to receive anticipated winnings), business interruption, loss of business information, or any other pecuniary or consequential loss (even where we have been notified by you of the possibility of such loss or damage). Nothing in these Terms will operate so as to exclude any liability for fraud, or for death or personal injury that is caused by our negligence, or any liability which cannot be excluded or limited as a matter of law. If you have played in a professional capacity, or in tandem with other customer(s) as part of a club, group, etc., or placed bets or bets in a coordinated manner with another customer involving the same (or materially the same) selections; in this instance, we further reserve the right, at our sole discretion, to restrict the total maximum pay out for the combined total of any such bets, to the equivalent of the maximum pay-out Limits permitted for a single customer (as outlined in the applicable rules). If we should become aware that you have played at any other sportsbook or online gambling service under any of the circumstances set out in clauses 14.1.1 through 14.1.12. In the event we terminate your account as a result of suspicious or illegal activity, we reserve the right to pursue criminal charges or other criminal or civil sanctions against you, and we reserve the right disclose any relevant information to the authorities or other third parties as may be necessary to pursue any remedies available to us in this regard. Acceptance and use of any win or prize at or from us or the Service. All offers are limited to one per person, family, household address, e-mail address, telephone number, same payment account number (e.g. debit or credit card, etc. ), and shared computer, e.g. school, public library or workplace. All offers are intended for recreational customers and we may, in our sole discretion, limit the eligibility of customers to participate in any given promotion. We reserve the right to withdraw the availability of any offer or all offers to any customer. We reserve the right to reclaim all bonuses awarded and/or any winnings accrued if a customer is found to be tampering with or abusing any aspect of any promotion. Where there is evidence of a series of bets placed by a customer and/or group of customers which, as a result of enhanced payments through promotional offers, results in guaranteed customer profits irrespective of outcome, we reserve the right to ignore the bonus element of such offers and settle bets at the correct odds. We further reserve the right to ask any customer to provide sufficient documentation for us to be fully satisfied as to the customer’s identity prior to us crediting any bonus, Free Bet/Bonus Bet or offer to their account. Customer support is available if you experience any difficulties. Customer support can be reached by email at [email protected]. Any complaints or disputes may be sent to this email address. To ensure your complaint/claim is directed to and investigated by the correct department, written communication must be submitted to us via the following means: E-mail: [email protected]. These Terms are governed by, and interpreted in accordance with, the laws of Zambia and you irrevocably submit to the exclusive jurisdiction of the courts of Zambia to settle any disputes (including claims for set off and counterclaims) which may arise in connection the creation, validity, effect, interpretation or performance of, or the legal relationships established by or otherwise arising in connection with these Terms. We do not provide advice regarding tax and/or legal matters. Customers who wish to obtain advice regarding tax and legal matters are advised to contact appropriate advisors. You are strictly prohibited from utilizing the Service and our systems to facilitate arbitrage through currency exchange transactions. Where we deem that you have deliberately used the systems for financial gain through arbitrage, any gains will be forfeited and deducted from your balance without warning or notification. Customers are strictly prohibited from using the Service and our systems to facilitate any type of illegal money transfer. You must not use the Service for any unlawful or fraudulent activity or prohibited transaction (including money laundering) under the laws of any jurisdiction that applies to you. If we suspect that you may be engaging in, or have engaged in fraudulent, unlawful or improper activity, including, money laundering activities or any conduct which violates these Terms, your access to the Service may be terminated immediately, by blocking your account or confiscating winnings achieved through the above mentioned activities. If your account is terminated or blocked under such circumstances, we are under no obligation to refund to you any money that may be in your account. In addition, we shall be entitled to inform the relevant authorities, other online service providers, banks, credit card companies, electronic payment providers or other financial institution of your identity and of any suspected unlawful, fraudulent or improper activity. You will cooperate fully with any investigation into such activity. By accepting any prize and/or winnings, you agree to being contacted and asked to consent for your name to be used for advertising and promotional purposes without additional compensation except where prohibited by law. These Terms represent the complete, final and exclusive agreement between you and us, and supersede and merge all prior agreements, representations and understandings between you and us with regards to use of our Service. We reserve the right to amend these Terms, or to implement or amend any procedures, at any time without prior notice to you. Such amendments will be implemented at the discretion of management and put into immediate effect. In the event of a discrepancy between the result showing on your software and our servers, the result showing on our server shall be the official and governing result. The use of ZWM/$ indicates Zambian Kwacha only. We shall not be liable or responsible for any failure to perform, or delay in performance of, any of our obligations under the gaming contract that is caused by events outside our reasonable control. In the event of a change of control, merger, acquisition, or sale of assets of the company, your customer account and associated data may be part of the assets transferred to the purchaser or acquiring party. In such an event, we will provide you with notice via email or notice on our web site explaining your options with regards to the transfer of your account. These Terms may be translated into many different languages. If there is any discrepancy between the English language version of these Terms and any other language version of these Terms in the meaning and interpretation of any of the provisions of these Terms, the meaning and interpretation of the provisions under the English language version shall prevail. We may offer the option 'Cash Out' for placed bets: You will have the option to accept settlement of bets You have placed before the result of the bet is determined. The ‘Cash Out’ amount is calculated based on the current odds and is subject to change depending on when you chose to accept a 'Cash Out'. If ‘Cash Out’ is available for a placed bet, the corresponding symbol will be displayed in the ‘My bets’ section of My Account or through the Betslip “My Bets’ Widget. If the ‘Cash Out’ value has changed immediately after the customer’s request before the conclusion of the 'Cash Out', the ‘Cash Out’ a message confirming this change will be displayed to the player, the player must then confirm if they are happy to accept the change. These terms and conditions govern your participation in any “Free Bet” or “Free Ticket” promotions offered by the Company. If you do not agree with these terms and conditions, you are not permitted to participate in such promotions and you should not accept any Free Bet offered by us. Your Account: This is the account that you registered with the Company. This account will consist of both your Cash balance and your Free Bet balance. Free Bet: the Company runs various promotions which may offer “free bets.” Any Free Bet that you qualify for will be added to your Free Bet balance, and can be used to place wagers. Free Ticket: the Company runs various promotions which may offer “free tickets.” Any Free Ticket that you qualify for will be added to your Free Ticket balance, and can be used to place wagers. Free Tickets may only be used on Jackpot and Bonanza coupons. Cash: This balance is the cash in your Account, and can be used to place wagers. A Free Bet and Free Ticket can only be used to place wagers, and cannot be transferred, substituted or exchanged. Any available Free Bet balance cannot be withdrawn. The Company’s general Terms and Conditions shall apply to all interactions with the Company, and must be read in conjunction with all other terms and conditions relating to promotions. In the event of a conflict between these Free Bet Terms and Conditions and the Company’s general Terms and Conditions, the Company’s general Terms and Conditions shall prevail. A Free Bet is available for a maximum of 7 days from the date that the Free Bet was credited to your Company Account. If not used, your Free Bet will automatically expire after 7 days and will be removed from your Company Account (unless specified otherwise in specific promotional terms). A Free Ticket is available for as long as the coupon for which it was awarded is open. Should the Free Bet be placed on a selection that is later voided, the original Free Bet wagered amount will be returned to the your Company Account. Should the Free Ticket be placed on a coupon that is voided/cancelled. The Free Ticket will not be returned to the players account. It is at the Company’s discretion that another Free Ticket be awarded to the customer. The Free Bet and Free Ticket is non-refundable and the Free Bet wagered amount is not included in any winnings. Only the winnings will be paid to your Company Account. If you wager ZWM 2 using your Free Bet, with odds of 4.0, the potential return would be ZWM 8, since the ZWM 2 wagered is a Free Bet credited to your Company Account by the Company, only the winnings of ZWM 6 will be added to your Company Account. The Maximum return of a Free Ticket is limited to the maximum potential return of the coupon that the Free Ticket is placed. Before any withdrawals are processed, your play will be reviewed for any irregular playing patterns. Using a combination of bets which include both a Free Bet and Cash on the same event to place equal, zero or low margin or hedge bets, shall all be considered irregular gaming for free bet requirement purposes. In the interests of fair gaming, should the Company deem that irregular game play has occurred, we reserve the right to withhold any withdrawals and/or confiscate all winnings. All Jumbo Jackpot games are owned and operated by SupaCasino Limited (“SupaCasino”). By using any Jumbo Jackpot game, you agree to be bound by the terms and conditions below which constitute a binding contract between you and SupaCasino. In the event of a conflict between these terms and the General Terms and Conditions these terms and conditions shall control as they apply to your use of such Jumbo Jackpot game. It is your responsibility to check that the Bet instructions you submit are correct before confirming the Bet. SupaCasino reserves the right to refuse placement of any Bet for any reason. SupaCasino may, in its sole and absolute discretion, decide to suspend betting on a game at any time. SupaCasino also reserves the right to void a game in its entirety or any Leg(s) or Bet(s): to correct any obvious errors; to maintain integrity and fairness in the Jumbo Jackpot games; if there has been a change to the format or events within a game; or if it believes any Bet has been placed in contravention of these Terms of Play or of the rules of a sports governing body or other relevant professional body. The Legs in any Game Period shall be selected by SupaCasino acting at its discretion. In specific games SupaCasino may give Players the option to place Bets at a fraction of the full unit cost predetermined for the game. For example, if the full unit cost in a game is ZWM 2 (as may be the case in the Pick 7 Correct Score game), SupaCasino may enable Players to place Bets for a fraction of this full ZWM 2 unit cost. Fractional Bets like this will give the Player a corresponding entitlement to any dividends payable at the point of game settlement. A Player betting in a currency other than Sterling may also be enabled to place Bets which are a fraction of the full local currency unit stake, for a corresponding entitlement to any dividends payable. Staking options available to Players betting in different currencies may differ, but in all cases Players will only be entitled to a dividend which is proportional to the cost of their Bets. In the event of any uncertainty about any official result, SupaCasino reserves the right to suspend settlement of any game until the uncertainty can be resolved to its reasonable satisfaction. SupaCasino reserves the right to reverse the settlement of a game if it has been settled in error (for example, a human or technical error). If SupaCasino resettles a game, this may lead to amendments being made to Players’ Account balances to reflect changes in game settlement. If a match is not completed - i.e. the full period of play (so 90 minutes in the case of soccer according to the match officials, plus any stoppage time) within 3 days of its scheduled start date, it will be considered a void Leg for the purpose of all games in which it has been included. Notwithstanding the provisions of this clause 1 above, in circumstances where SupaCasino reasonably believes that a match (whether started or not) will not be completed within 3 days of its scheduled start date, SupaCasino reserves the right to declare the match to be a void Leg at that point for the purpose of relevant games (irrespective of whether the match is ultimately completed or not within 3 days of its scheduled start date). The voiding of any Bets or Legs as described above in relation to abandoned/postponed fixtures will not apply to Bets/Legs unconditionally determined at the time of abandonment/postponement. For example, if SupaCasino offers a Leg based on the score at half-time in a match, the abandonment of the match at any point after half-time is not relevant to the completion of the Leg in question. References above within this clause 1 to a particular number of 'days' shall mean the end of the day in local time (where the fixture is taking place) after the expiry of the specified number of days. For example, if a match is scheduled to be completed on 15th November when a game is loaded on the site, then the rule that allows the match to be completed within three days after the scheduled completion date would mean that the deadline for completion of that match would be 23.59:59 local time on 18th November. If any game is decided on fewer than the advertised number of Legs, then any guarantees or rollovers otherwise applicable to a game, will be disapplied. In such circumstances Win game and Consolation game dividends will be declared based only on the net stakes of tickets purchased for that specific game, although SupaCasino reserves the right to apply a substitute guarantee to any such game. Provided at least one Leg of the game takes place, a Win Game dividend will be declared. If no Legs of a game are completed, all Bets in that game will be void and stakes will be refunded. This excludes stakes rolled over from previous games, which will be rolled over for use in future games as determined by SupaCasino. If the scheduled venue for a Leg is changed after a game has been loaded by SupaCasino, the Leg will be void only if the new venue is a home ground of the original away team. For matches played at a neutral venue bets will stand regardless of which team is listed as the home team. SupaCasino accepts no responsibility for typing, transmission and/or evaluation errors. SupaCasino also accepts no liability for incorrectness or incompleteness or inaccuracy of the information provided via the site, including (without limitation) any clock counting down to the beginning of the next passage of play in a game, any live scores and results. SupaCasino does not accept any responsibility whatsoever in relation to Players seeking to cooperate with each other to improve their chances of winning any prizes or making any cash-outs. Players enter into any such arrangements entirely at their own risk. Notwithstanding the terms described above in relation to matches which are not completed, SupaCasino at all times reserves the right to decide the result of a postponed/cancelled match in any of the Pick 13 Jackpots via a live, audited draw. The result of the draw is final and not up for contestation regardless if the match is played later. All Bets are game bets where winnings are determined by reference to the money staked and the number of correct entries in the game. Bets which correctly predict scores and/or outcomes of the required number of Legs will win a share of the Win Game prize fund, and where applicable Consolation Games prize funds. "Win Game" - Players who select the correct result (being the correct score in score games, correct margin in points margin games and the correct home/draw/away outcome in 1x2 games) of all the Legs of a game will win a share of the Win Game prize fund. "Consolation Games" – In certain games Players who select all of the correct results except for one, two, three or more results as applicable, shall share the relevant Consolation Game prize fund. The Win Game will grow and rollover independently depending on whether it is won whereas Consolation Games will offer a fixed prize fund to be split amongst winning Players. SupaCasino will endeavour to apply all such rollovers to the next equivalent game (for example, an English Premier League Pick 6 game rollover will typically be applied to the following week’s English Premier League Pick 6 game), but rollovers will be applied by SupaCasino acting at its discretion. For all games 70% of stakes shall be allocated to the Win Game. Each winning Line in a ticket is only eligible to win the single highest relevant prize fund applicable to such Line. For example a Line which includes the correct score in each of the six Legs of a correct score Pick 6 game will win a share of the Win Game prize but no Consolation Game prizes which attach to that Pick 6 game. Similarly a Line in that same game which includes five of the six correct scores (but not six of six correct) will win a share of the ‘all but one’ Consolation Game prize and therefore will not be eligible for the ‘all but two’ Consolation Game prize. All Jumbo Jackpot dividends and partial cash-out transactions will be rounded down to the nearest one pence (or currency equivalent). For example a dividend of ZWM 4,196.758 will be rounded down to ZWM 4,196.75 and the cashing out of 10% of an offer of ZWM 256.42 for 100% of a Live Ticket, will be rounded down to a cash-out amount of ZWM 25.64. SupaCasino may at any point during the Game Period offer Players the opportunity to cash-out the whole or a portion of a ticket which may still, potentially, contain a winning Line ("Live Ticket"). 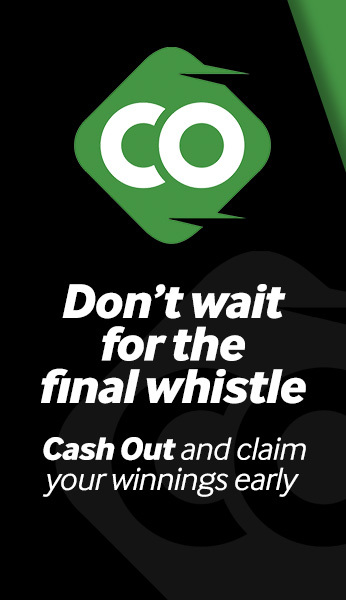 The availability of cash-out offers can never be guaranteed and during periods when typically cash-out offers would be available (after the conclusion of one Leg in a game and before the commencement of the next Leg, or for some sports including soccer, during the half-time period in any given Leg), cash-out offers may be unavailable for technical, operational or any other reason. In its offer to purchase a Live Ticket ("Offer") SupaCasino shall provide to the Player an offer price to purchase any 10% increment of the Live Ticket up to 100% ("Offer Price"). The Offer Price shall be determined by SupaCasino acting at its discretion. The Player will be notified of an Offer via his/her Account. Following receipt of an Offer, the Player shall have the period between the making of the Offer by SupaCasino and the lapsing of the Offer to decide whether to ACCEPT the Offer (C) or REJECT the Offer (D). SupaCasino reserves the right to revise or withdraw an Offer that has not been accepted. All Offers automatically lapse on commencement of the next period of live play. If the Player accepts an Offer for 100% of a Live Ticket all rights in the Ticket will be assigned to SupaCasino and the Offer Price shall be transferred into the Player's Account as soon as is reasonably practicable. See clause 3.7 below on selling a portion of a Live Ticket. If the Player rejects an Offer (or takes no action in respect of the Offer) the Player will retain full ownership of the Live Ticket and accordingly retain his/her chance to win or share the relevant prize funds. For the avoidance of doubt, once a Live Ticket is fully cashed-out you will no longer be able to win any amount in respect of that ticket. If any Bets on that ticket are ultimately successful, SupaCasino will be entitled to the relevant Win Game dividend (together with any Consolation Game dividends) that you would have been entitled to had you not sold the Live Ticket. The Player shall retain ownership of the remainder of the Live Ticket and if the Live Ticket is successful the Player will be entitled to such percentage of the amount of the Win Game (together with the same percentage of any Consolation Games) applicable to his/her retained share of the Live Ticket. Player A cashes-out a 20% Portion and subsequently a 30% Portion (so 50% in total) of a full unit Live Ticket. The Live Ticket is a correct prediction of the scores of all Legs in the Game Period, which proves to be a winning Bet for the purposes of the Win Game. There is one other full unit Win Game winning Bet in the Game (held by Player B). The net Win Fund holds ZWM 10,000,000. Win Game: ZWM10,000,000 ÷ 2 (as 2 winners) = dividend of ZWM 5,000,000. 50% of ZWM 5,000,000 (Player A's retained share in Live Ticket) = ZWM 2,500,000. Player A’s Win Fund share: ZWM 2,500,000. Where an Offer which has been accepted by a Player (in full or in part) has been made by SupaCasino based on erroneous information (for example based on a half-time score being 0-0 when the score is in fact 0-2) or as a result of a technical failure, SupaCasino reserves the right to void any such Offer or to adjust the cash-out amount payable. Any such adjusted cash-out payment will be based on the accurate score/result at the time of the erroneous Offer being made and the consequent revised value of the relevant ticket at that time. Where an Offer which has been accepted by a Player (in full or in part) has been made by SupaCasino on the basis that all scheduled Legs in a game will be completed (and therefore any guarantee and rollovers are factored into such an Offer), but all such Legs are not completed, SupaCasino reserves the right to adjust the cash-out amount payable. Any such adjusted cash-out payment will be based on the revised value (given the amounts available to be won in the applicable games and the revised likelihood of success) of the relevant ticket at the point the Offer was made. We are committed to doing best endeavours to give our customers an enjoyable gaming experience, whilst recognising that gambling can cause problems for a minority of individuals. To ensure that you continue to enjoy safe and manageable play we fully support responsible gaming and have numerous measures in place to offer checks. Drum of the game machine – a part of the game machine where all the balls are placed after the presentation. Later, the balls are shuffled and the winning balls are randomly selected. 1.5. Odds – numerical expression determined by the game organizer, which is multiplied by the amount of the player‘s stake to calculate the winnings. For the avoidance of doubt, once a Live Ticket is fully cashed-out you will no longer be able to win any amount in respect of that ticket. If any Bets on that ticket are ultimately successful, Digi Bay will be entitled to the relevant Win Game dividend (together with any Consolation Game dividends) that you would have been entitled to had you not sold the Live Ticket. winning balls out of 42 are randomly drawn into the game tube. Maximum and minimum betting limits are determined by the gambling company. The balls are not prepared before the start of the draw. The presenter must put the balls to the specified place (machine) so it can be clearly seen that a full set of unmixed balls is used. A ball or balls cannot be seen on screen due to the presenter‘s actions. Video and audio streaming do not match or do not exist. If a player cannot see the live broadcast due to technical reasons at its end (no internet connection, no electricity etc.) but the broadcast can be found in the archive, draw is deemed to have taken place. Organizer has the right to change the time and duration of the broadcasts. Results of each draw and archive for the broadcasts can be found on the game organizer‘s website. A set of 42 balls (see 1.2). These Rules and Regulations are published in a number of languages for information purposes and ease of access by players. It is only the English version that is the legal basis of the relationship between Player and the Operator and in case of any discrepancy between a non-English version and the English version of these Rules and Regulations, the English version shall prevail. All the claims of the Player related to the results of the draws or other technical issues should be addressed to the Operator no later than 30 (thirty) days after the draw in question. Numbers betting results are sourced from real-world lotteries and all numbers wagers are based on the numbers resulted from the Lucky Numbers game selected by the player. All numbers bets for a specific draw must be placed and confirmed before the draw cutoff, as well as before the first number is drawn for the wagered bet. All numbers betting markets are fixed odds bets, with one outcome, a win or a loss. No consolation prizes are offered for any draws and/or markets. All of the selected numbers drawn must match the wager entry in any order or must match the wagered market and must have resulted correctly for the bet to win. For a successful wager, the player must select a market type, select the numbers or expected market outcome for a draw, choose the wager stake and make the bet before the Lucky Numbers draw has its first ball drawn or the cutoff countdown has expired, after which the results must be published correctly. Following the publishing of valid Lucky Numbers results, all wager payouts will be paid directly to the player's account wallet. The sum of balls drawn will be odd or even – The sum of the regular balls drawn will be odd or even. The sum of the regular balls drawn will be within a specified range - There are fourteen different ranges within which the player may predict the winning total . The bonus ball drawn will be odd or even - The player wagers whether the bonus ball drawn will be odd or even. This bet option is only available for lotteries with one bonus ball. The sum of the bonus balls drawn will be odd or even - The player wagers whether the sum of the bonus balls drawn will be odd or even. This bet option is only available for lotteries with two bonus balls. The bonus ball drawn will be over or under - The player wagers whether the bonus ball will be over or under the set boundary. This bet option is only available for lotteries with one bonus ball. The sum of the bonus balls drawn will be over or under - The player wagers whether the sum of the bonus balls drawn will be over or under the set boundary. This bet option is only available for Lucky Numbers games with two bonus balls. The bonus ball drawn will be a single digit number - The player wagers whether the bonus ball will be a single digit number. In Lucky Numbers games with two bonus balls, at least one bonus ball needs to be a single digit for the player to claim the winning. This market is not available for the draw types where there are only single digit numbers in the bonus ball draw. The bonus ball drawn will be the same number as one of the regular balls drawn - The player wagers whether the bonus ball will be the same number as one of the balls in the regular draw. In the case where two bonus balls are drawn from the additional drum, the player claims the winning if either of the bonus balls drawn is equal to any ball drawn in the regular draw. The sum of the bonus balls drawn will be within a specified range. - The player wagers whether the bonus ball drawn will be within one of the 5 ranges offered. This bet option is only available for Lucky Numbers games with one bonus ball. The sum of the regular balls and the bonus balls will be over or under - The player wagers whether the sum of the numbers drawn including the bonus ball will be over or under the set boundary. Standard bet (without bonus ball) - Depending on the type of the Lucky Numbers game, players select numbers that they believe will be drawn; in order to claim the winning the player must predict all drawn numbers.. All numbers selected in one bet must be drawn in order for it to be a winning bet. Standard bet (incl. bonus ball in the same drum) - The players select numbers based on the rules of the Standard bet, but the probability of winning is increased as the hit of the bonus ball will count as well. All numbers selected in one bet must be drawn in order for it to be a winning bet. Standard bet (incl. bonus ball from the additional drum) - The players choose numbers based on the rules of the Standard bet, but the probability of winning is increased as the hit of the bonus ball will count as well. In the case where there are two bonus balls drawn, the player must match the numbers selected from the regular draw, and one of the bonus balls to claim the winning. All numbers selected in one bet must be drawn in order for it to be a winning bet. If for any reason a bet is placed after the first number is drawn, the wagers will be voided and the full stake will be refunded. If a draw time is re-scheduled, the draw will be cancelled, and all affected wagers will be refunded. A new draw may be introduced with the re-scheduled time slot. Numbers draw's shall be resulted in accordance with the first result obtained from the official Lucky Numbers website. If any mistakes and/or alternative submissions are published, the draw will be cancelled and all wagers will be refunded. All wagers that cannot be settled for any reason will be voided and refunded. Participation at the Casino is at your sole option, discretion and risk. You are solely responsible for ascertaining whether it is legal in Your Jurisdiction to participate at the Casino. You may only participate at the Casino if it is legal for you to do so within Your Jurisdiction. In addition to the provisions of 1.1.3 above, you may only participate at the Casino if you have attained the legal age of majority within Your Jurisdiction. We have the right to request that you furnish us with proof of your identity and age as a prerequisite of your participation at the Casino and at any time throughout Your participation at the Casino. You agree that we may use personal information provided by you in order to conduct appropriate anti-fraud checks. Personal information that you provide may be disclosed to a credit reference or fraud prevention agency. The agency may, at its discretion and according to its policies, keep appropriate records of such information. You hereby agree to hold no more than a single real account at the casino. Any sale or transfer of accounts between players is prohibited. Participation on credit is prohibited with us. have read and understood these Terms and Conditions. You acknowledge hereby that the Casino is not obliged to give you prior notice of its decision to refuse, deregister or exclude or suspend you, nor to furnish you with any reasons for such decision. If you feel that you are losing control of your play and would like help by restricting access to our casinos, you may choose to be excluded from the casinos for either 24 hours or six months. If you choose either of these options, you will not be able to log in to our casino software during the exclusion period. The casino will make every effort to ensure that you are blocked from entering the site. We will also take all reasonable steps to ensure you do not receive any promotional material during this time. have forfeited to us any contested funds that may be derived by you from fraudulent, illegal or similar misconduct. It is recorded that the provisions of this Clause 1.5 only apply if all of a Real Player's Accounts at the Casino and constitute Dormant Accounts. Notwithstanding meeting any play through requirement, in our sole and absolute discretion, you may lose any bonuses and winnings derived from such bonuses if such moneys remain unused by you at the Casino for a period of six months from the date on which such bonus(es) were awarded. It is recorded that some jurisdictions have strict laws on money laundering that may impose an obligation upon us to report you to the federal or local authorities within such jurisdictions if we know, suspect or have reason to suspect that any of your transactions, amongst other things, involve funds derived from illegal activities or are intended to conceal funds derived from illegal activities or involve the use of the Casino to facilitate criminal activity. furnish any relevant information about you to an intra-group database recording such mischief. You hereby irrevocably authorize us to do so in our absolute discretion. utility bill (e.g. gas, water, telephone etc) bearing your name and your address registered with us. 1.6.4.3. notwithstanding the aforegoing, we additionally reserve the right to require any of the above documentation at any time during our dealings for the purposes of identity verification. If, whilst playing at the Casino, you win a sum of money or any other prize regarded by the Casino as worthy of publicity, you agree to make yourself available for any event of any kind arranged by the Casino in order to publicise your win and any such prize. You hereby give the Casino permission to utilize your name, photograph and the content of any interviews relating to your win and any such prize. Furthermore, you hereby waive all rights in any of these materials and agree that all rights in and to such materials will belong to the Casino. The Casino will do its utmost to protect your privacy at all times. We may temporarily suspend the whole or any part of the Service for any reason at our sole discretion. We may, but shall not be obliged to, give you as much notice as is reasonably practicable of such suspension. We will restore the Service, as soon as is reasonably practicable, after temporary suspension. In the event of a Casino system malfunction all bets are void. In accordance with clause 4.2 below, we will not be liable to you for any loss that you may incur as a result of such suspension or delay. use or re-use of the Casino software, whether downloaded from the Casino Website or by any other means or through any other medium. In no circumstances whatsoever shall the Casino, its directors, officers, employees, shareholders, agents and affiliates, the ultimate parent and parent companies of the Casino and any of its subsidiaries be liable to you in contract, tort, negligence or otherwise, for any loss or damage howsoever arising from any cause whatsoever, whether direct or indirect, or for any amounts whatsoever (even where we have been notified by you of the possibility of such loss or damage). It is recorded that the Casino shall, from time to time, offer certain promotions and competitions and that these competitions and promotions may have separate terms, conditions and rules that are competition or promotion-specific. These Terms and Conditions apply to any competition or promotion. In the event of a conflict between these Terms and Conditions and the promotion or competition-specific Terms and Conditions, the promotion or competition-specific Terms and Conditions shall prevail but only to the extent that the Terms and Conditions conflict with one another. In addition to these Terms and Conditions certain Rules of Play shall apply to you and be binding upon you in respect of your participation at the Casino. You hereby agree to be bound by the aforementioned Rules of Play as if they were specifically incorporated into these Terms and Conditions. You acknowledge and agree that all copyright, trademarks and all other intellectual property rights in all material or content supplied as part of the Casino Website and the Software shall remain at all times vested in us or our licensors. You are permitted to use this material only as expressly authorized by us or our licensors. You acknowledge and agree that the material and content contained within the Casino Website is made available for your personal non-commercial use only and that you may download such material and content onto only one computer hard drive for such purpose. Any other use of such material and content is strictly prohibited. You agree not to (and agree not to assist or facilitate any third party to) copy, reproduce, transmit, publish, display, distribute, commercially exploit, tamper with, or create derivative works of such material and content. Neither the Casino, nor its parent or any of its affiliates, agents, network service providers, partners, representatives or employees warrant that the Casino Software will be free from any virus or other code that is contaminating or destructive by nature and you are responsible for implementing and maintaining sufficient procedures to satisfy your particular requirements for accuracy of data input and output as well as protection from such viruses or other code that may contaminate or destroy your mobile phone, system or data. Neither the Casino, nor its parent, affiliates, agents, network service providers, partners, representatives or employees warrant that the Casino is error free or will operate without packet loss or interruption, nor does the Casino warrant any connection to or any transmission over the Internet. The Casino may, without notice to you, amend, alter, delete, interlineate or add to ("Changes") these Terms and Conditions, the promotion or competition-specific Terms and Conditions or Rules of Play at any time whatsoever. These Changes shall become effective, and you shall be bound by these Changes, immediately upon their posting on the Casino Website. You agree to regularly review these Terms and Conditions, promotion or competition-specific Terms and Conditions and the Rules of Play regularly in order to assess whether any Changes have been made. The Casino's employees, subsidiaries and affiliates connected to any referral programs linked to the Casino, advertising or other agencies, licensees, licensors, distributors and their other associated or affiliated companies or, in the case of individuals, the immediate family of such individuals, are not eligible to participate at the Casino as a Real Player. No indulgence granted by the Casino to you should be construed as a waiver of any of our or the Casino's rights in terms of these Terms and Conditions. We reserve the right to transfer, assign, sub-license or pledge, in whole or in part, any of the rights and obligations granted to or imposed upon us by these Terms and Conditions. You may not transfer, assign, sub-license or pledge any of the rights and obligations granted to or imposed upon you by these Terms and Conditions. The validity, construction and performance of this Agreement shall be governed by Zambia law and shall be subject to the non-exclusive jurisdiction of the Zambia superior courts to which the parties hereby submit, except that a Party may seek an interim injunction in any court of competent jurisdiction. You hereby agree that any legal proceedings to enforce any claim that you may have (if any) against the Casino shall be initiated by you within a period of 6 (six) months of the cause of action arising (the "Prescription Period"); failing which you hereby forever waive and abandon any right that you may have to enforce such claim after the Prescription Period and confirm that on the expiry of the Prescription Period the said claim shall be void, waived and abandoned in law. In the event of a conflict between the English terms and conditions and other language versions, the English version shall prevail. We are committed to doing best endeavours to give our customers an enjoyable gaming experience, whilst recognising that gambling can cause problems for a minority of individuals. To ensure that you continue to enjoy safe and manageable play we fully support responsible gaming and have numerous measures in place to offer checks. Gambling involves risk. By gambling on this website, you run the risk that you may lose. We take stringent steps to ensure that only people of legal age use our Services, including requesting you to send us a photocopy of your identification documents, such as a driver's licence or identity card, to verify the age and identity of new customers. The legal age for gaming online varies from country to country and so we advise that you do check the rules of your jurisdiction before you play. Any personal details we request from you are purely to verify your identity – this is a legal requirement for both your own and our protection. If you have any questions about our identity checks, please do not hesitate to contact us at any time. To request a cooling-off or temporary suspension, please send an email to [email protected] and this request once received will be verified telephonically with the player. Measures will be taken by us to restrict gaming activity related to suspended accounts until the suspension period expires. In the case of a permanent self-exclusion request, we will contact you with a view to returning any remaining funds held in the account balance, less bonus money. Upon the self-exclusion period expiring, your account will not automatically be re-activated. NOTE: The account may only be considered for re-activation by us upon a Customer's own request (contact must be either by telephone or in person) and may only come into effect after a 24 hour cooling-off period has been instituted. Information regarding your account activity can be viewed online. The information may include: details about your account balance, gambling history (including bet amounts, winnings and losses), deposits, withdrawals and other related transactions. We comply with all applicable data protection and privacy laws. If you do not understand how we handle or use the personal information you provide to us, then you are invited to send in any questions to www.betway.co.zm. During the registration process; when you use your account; and when you request a withdrawal from your account, specific personal data (“Personal Data”) is collected including, but not limited to: government-issued ID number, phone/mobile number, first and last name, date of birth, credit card data, home or another physical address, e-mail address, or other contact data. We will authorise the financial institution which you used when registering an account, to provide information about you should this be requested by the local Gambling Commission in relation to your gaming. We will disclose personal data when ordered to do so by any governing authority and/or under any legal provision contained in the governing law. We will also disclose information as required to enforce our Terms and Conditions. We reserve the right to process personal data for CRM / marketing purposes. By registering an account, you automatically opt in to all promotional marketing across all platforms. You can opt out at any point by contacting us at www.betway.co.zm. Our website may, from time to time, contain links to and from the websites of our partner networks, advertisers and affiliates. Please note that these websites may have their own privacy policies and that we do not accept any responsibility whatsoever for these policies. Please check these policies carefully before you submit any personal data, as we cannot be held responsible for the policies of partner websites. You have the right to request access to your own personal data and/or have the right to correct and/or erase wrong and/or inappropriate data, so long as specific gaming regulations do not require us to retain certain personal information about you. To exercise such rights, you are required to submit a request together with proof of identity to www.betway.co.zm. In registering an account to use our service, you consent to us contacting you through any and all means of communication (whether in written or verbal form and including, but not limited to e-mail, telephone and SMS) in respect of matters relating to your account. To unsubscribe from any or all forms of communication, please either use the ‘Unsubscribe’ link found in our promotional e-mails or contact us at www.betway.co.zm.